I am not quite so adventurous to take on a cross country bike ride without a lot of planning and at least a little bit of practice. This Easter weekend I had planned to get up early and drive with my bike and gear loaded from our home in Indianapolis and head south on I-65 to the town of Scottsburg, IN. The plan was to park my car at the Super Walmart just off the Interstate, then ride to Bloomington, IN to celebrate on Saturday, an early Easter dinner with family later that afternoon. With my gear in tow, I would spend the night with my mother-in-law, Bev. Sunday morning I would ride back to my car at the Walmart and drive home that evening. This would give me two consecutive days of 70-75 miles riding through open country and a few nasty hills. It would also give me practice carrying all my gear in the loaded panniers and that general feeling of being on my own during the day. I got up at 5:10 AM Saturday and was on my way driving by 5:40 AM. With a final bio break just before Scottsburg, I had reassembled the bike, loaded the panniers, fixed the water bottles and was on my way out of the Walmart lot around 7:50 AM. Without too many stops, I thought I could make Bloomington by 2:30 PM. The night before I had done a simple google maps bicycle route that would take me along many county and state roads. It was a chilly 36 degrees and I had on my baklava, leg warmers, long fingered gloves, and multiple layers under my bike jacket. At the major turns, I would pull out my phone and double check on google maps to make sure I was still on the planned route. The sun was out and I was catching a tail wind, so I was feeling really good, in spite of only 5 hours restless sleep the night before. Things were going great until I got about 10 miles outside of Scottsburg, looking to turn north on County Road 850 East as I sped west on County Road 800 South. Where 800 S met 850 E, the road was supposed to come to a “T”. There I would make a right and go north. Unfortunately, when I got to that point, the road was indeed marked as 850 E, but there was no “T”. The road only made a corner heading south. Either google maps was wrong, or some farmers decided to take away the part of the road that went north. I had passed a gravel road just before the “Phantom T”, so I doubled back and headed north on that road thinking it might have been mis labeled. 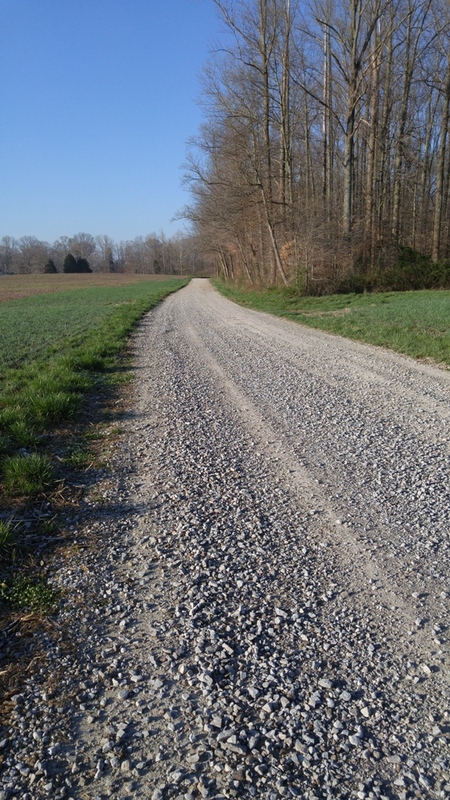 On my 700×25 road tires, the gravel got bumpy and treacherous pretty quickly, especially on an uphill. I thought the bike was getting a little hard to pedal and when I looked down at my rear tire, I thought it looked low. Sure enough, I had a flat. I’m hoping it was just a coincidence that the flat happened on the gravel. I had just installed some new “Ultra Gatorskin” tires that are supposed to be impervious to flats. I don’t know if the gravel was really Krypton ore, but my tire was definitely flat. I’ve had flats before and I have lots of experience swapping a tube out while in the middle of nowhere. I had loaded 2 brand new tubes in small bag that fits under my seat. I keep a pair of plastic tire “irons”, some glueless patches, an allen wrench multi-tool with screwdriver options, and one of those other multi-tools that has pliers, wire cutters, knife, screwdriver and bottle opener (you never know when you might want a bottle of beer). Fixing the flat is pretty easy for me. Fixing a flat on the front wheel is really easy. Fixing a flat on the rear wheel can be a little trickier because you have to deal with the chain and decoupling the rear gear cluster from the dérailleur. You have to lift the bike and put it in high gear before you take off the rear wheel. Your hands are bound to get greasy and it’s easy to get some minor cuts from the sprockets of either the rear or even front cogs. By virtue of the rear rather than the front going flat, my degree of difficulty had already gone from a 2 to a 5 on a scale of 1 to 10. Given that I had a special rack on a road bike that mounts on the rear axle and rear brake, along with 20 pounds of loaded panniers, on a gravel road in the middle of nowhere, I think my attempted performance now went to an 8. If it had been raining or snowing, I could have gone for a 10, but I settled for the precipitation that was dripping from my nose from the now 40 degree weather. I kept a calm demeanor and went about the task of stripping off the seat bag and unloading the necessary tube and tools. I freed my pump from the frame. The Ortlieb panniers popped off the rear rack with a simple pull. I lifted up the rear wheel and worked the shifters to get it into high gear, so the wheel could be removed easier. Finally, I not only had to turn the quick release levers on the “skewer” that holds the rear wheel in place, I had to completely unscrew the the locking nut, being careful not to lose the small spring needed to reassemble the wheel. Having completed that task, I worked tire irons on the wheel to pry the tire from one side of the rim so I could remove the lifeless tube. With 2 fresh tubes in my bag, I wasn’t concerned with patching the dead tube. I pulled out a fresh tube. It was lightly coated in talcum powder thanks to some preparation I had done when I packed it. My hands were getting a little cold, but I got the tube on and started working the tire back onto the rim. This requires some good finger and thumb strength, even with the tire irons to help. More than once a tire iron would flip off the rim – “ping” and fly into the nearby grass, as I tried to get the last bit of the tire on the rim. Since these were new tires made of “Ultra Gatorskin”, it made the job of stretching the last couple of inches over the rim that much more difficult. There is always the danger of pinching the tube in that last bit of mounting the tire – undoing all the work by creating more damage. With the new tire and tube in place, I started pumping it up. The little Topeak pocket rocket pump worked well to inflate the tire, but it took a lot of pumping. It seemed to hold the air, so I started on the even more difficult task of getting the rear wheel back on. Without a bike stand, I needed to support the frame, guide the wheel onto the chain, work it into position on the dérailleur, and then somehow manage to thread the skewer through the special rear rack brackets, and finally screw the special nut onto the skewer without losing the aforementioned spring. My back was starting to hurt from this bicycle repair version of “Twister” that I was playing. I had wiped most of the grease off my hands on some old corn husks I found in the field. I was feeling pretty good about it all and felt the tire one more time to make sure it was ready to support the weight I was about to re-load onto the bike. To my horror, it felt a little soft. I knew something had gone wrong, but I still had one more tube left, so I wasn’t panicking – yet. I did try to see if I could find the hole in either of the bad tubes I had just changed. I didn’t have a water container to try and isolate the damage, but my nose was running enough that I could have located the hole with some of my own liquids. Since I still had another tube, I didn’t need to get that desperate. Feeling a little more anxious than during the previous ritual, I repeated my performance of Twister, tire irons, tubes, and tire stretching. I had a few cuts to clean, along with the grease from the chain. Thankfully, my final tube held its air. I repacked the seat bag and mounted the panniers and my trusty bike pump. Since I was in the middle of nowhere, I took a moment to do a quick bio break. Since I usually wear bib biking shorts, it makes for a more complicated process. I have to take off most of my top layers before I can take care of business. On that day, it meant I had to remove my sunglasses with mirror, my helmet, my bike jacket, and the bike jersey with pockets filled with my wallet, keys, and trail mix. This does not make for a quick process, even if you are a guy. Between all the coffee I had at breakfast and the drive to Scottsburg and the water I had been drinking along the way, it seemed like a long time to be in a vulnerable position answering the call of nature. There was no “blue” 850E that went north, only the “white” that went south. I went up Vernon in hopes that it might be 850E that went north. It was a bad decision. 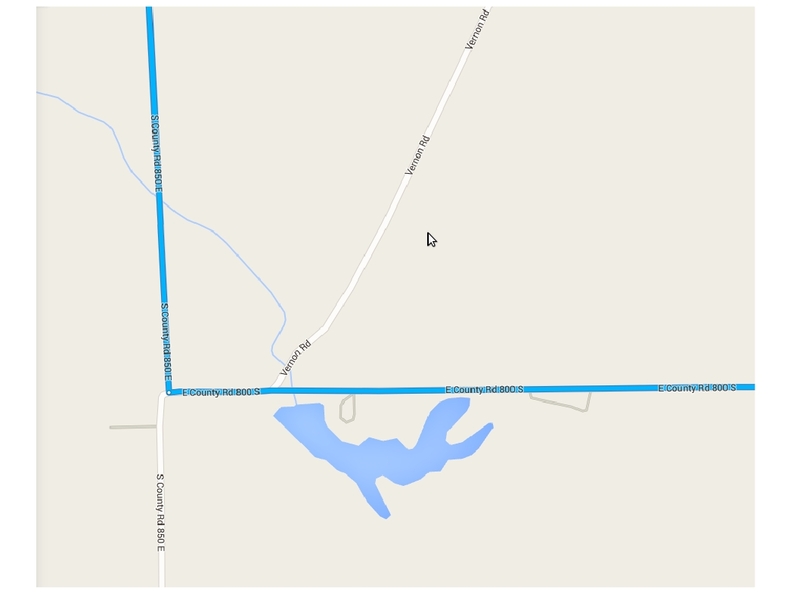 Checking google maps again, I could see that this gravel road was not the “missing 850 E” that I was seeking. I felt like Columbus. The experts had given me bad directions, one of my ships had sunk, and I was still a long way from the goodies I was seeking. The forced detour added a good 5-7 miles to my journey as I had to double back the way I came and head in an opposite direction to catch the paved roads that would connect me back to my original route. That might not sound like much if you are driving a car, but on a fully loaded bike, that’s an extra half hour. I had already lost almost an hour playing Twister and fixing the rear wheel configured with an especially torturous carrier rack. I might be a little late for dinner. As I continued on, I was at least catching some tail wind. It was sunny and it was slowly getting warmer with each mile – and so was I. The next town was Brownstown. I thought I could get something to eat, strip off some of my outer layers, put on cooler gloves and generally get refreshed. I had hit a few bumps in the road and as I came into Brownstown, I thought I could hear something rubbing on one of my tires. There was that unmistakable little “vvvt – vvvt “ sound that had a frequency that was synchronized with that of the spinning tires. I stopped a couple of times to check front and rear brakes, giving both wheels a quick test spin. They seemed fine. I went on into Brownstown and stopped in a McDonalds. I got into one of my panniers and took out the lock and cable I carry and secured my bike, Hidalgo, to the flag pole outside the restaurant. I took the panniers inside with me. 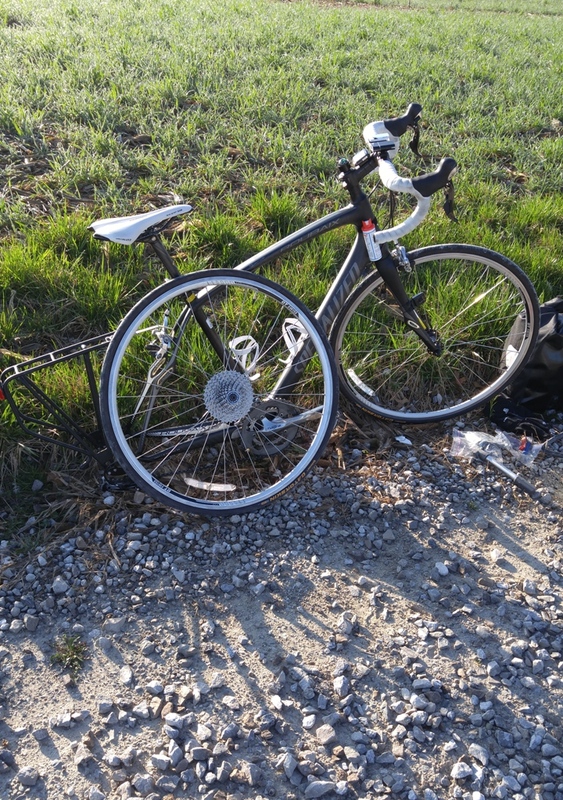 When I came out, I unlocked the bike, remounted the panniers and wheeled the bike over the curb. As the rear wheel bounced, the bike suddenly became difficult to push. Upon further examination, I found the cause of the rubbing sound. The bolt was touching the tire and was the source of the rubbing sound I had heard. 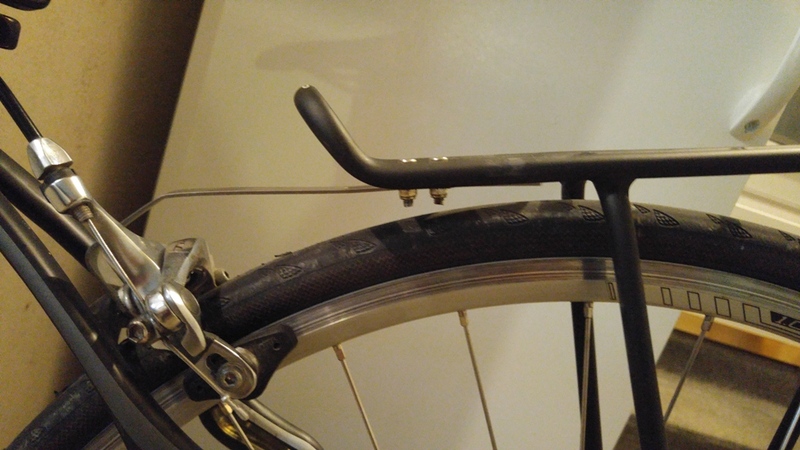 The metal bracket that connects to the brake mounting was now bending after any bump. 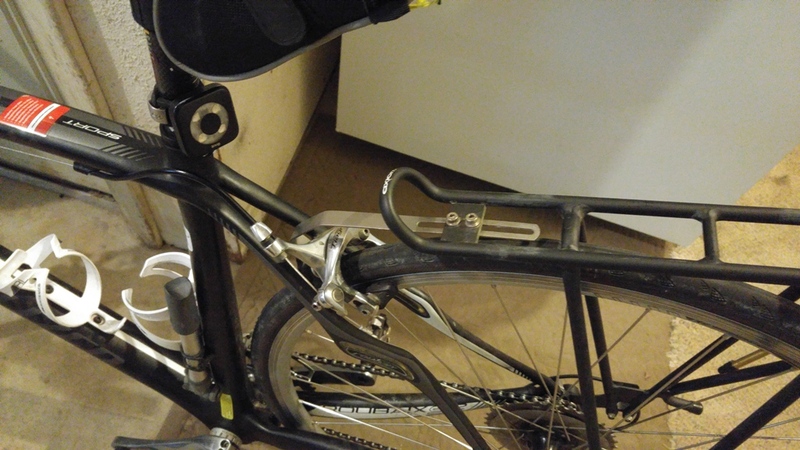 Besides the axle, the rack is supported by a metal bracket that attaches to the bolt that holds the rear brake. This bracket is secured to the rack by 2 short bolts and nuts. These bolts had now sunk to a depth that had them rubbing on the tire. I got into the tools in my seat bag and was able to adjust the positions on the bracket to give some clearance between the bolts and tire. I repacked the tools, came over the curb and once again, the bolts were rubbing the tire. I found that I could pull up on the rack and the metal bracket would bend enough to give clearance for the tire and bolts. Unfortunately, a few more bumps on the road would cause the bracket to bend the other way and rub on the tire again. I suspect that I might have damaged the bracket when I was changing the tire. I had not removed the bolts from the bracket and maybe I had bent it a little bit and created the start of the metal fatigue. Regardless, I decided to end my practice session and called my wife to come retrieve my remains with 29 miles under my belt, instead of 75. I had lost too much time and had too much distance left. The good part of the story is that this was practice and someone could bail me out. If something had to go wrong, better southern Indiana than the California desert. The metal bracket and rear rack had done their job on 3 other overnight trips. So I think the rack is capable of supporting the weight, but I will need to get a replacement bracket – maybe 2, so I can have an extra. I also think I should remove the rack support bolts next time I need to remove the rear wheel. This would prevent damage to the weight bearing bracket.